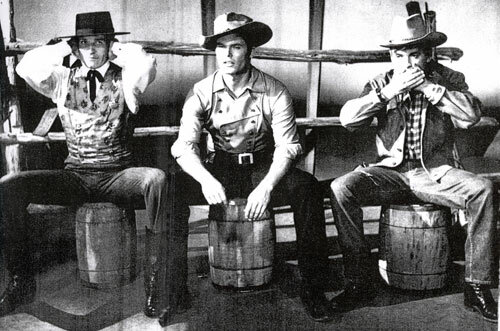 Hear no evil Hugh O’Brian as Wyatt Earp, See no evil Ty Hardin as Bronco Layne and Speak no evil Will Hutchins as Tom “Sugarfoot” Brewster. Taken from a 1960 PHOTOPLAY annual. 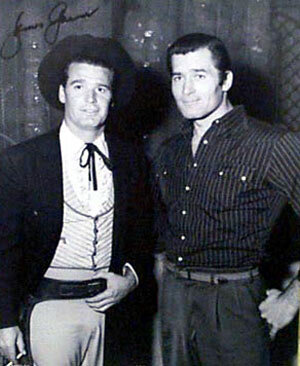 James (“Maverick”) Garner and Clint (“Cheyenne”) Walker at Warner Bros. circa 1959. 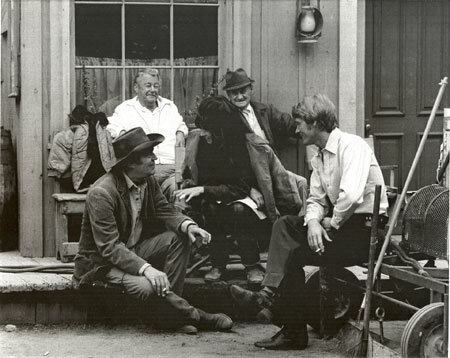 Note the cigarette in Garner’s hand. 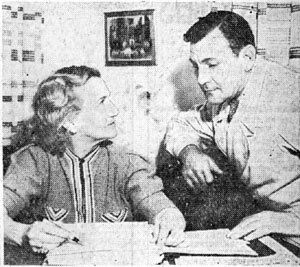 Buck Jones and his production manager Irene Schreck go over some expenses in March 1937. 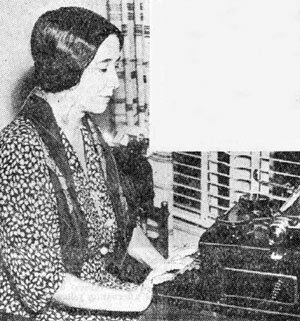 Schreck came to Hollywood in 1915 and started as one of D. W. Griffith’s stenographers. She later worked as secretary to the studio manager of the old Metro lot and helped design scenery for Stan Laurel comedies at Universal. She started as Buck’s production manager in 1934. Very rare photo of screenwriter Frances Guihan in March ‘57. Born September 22, 1890, in East St. Louis, Guihan started writing scenarios in 1916 for Japanese actor Sessue Hayakawa, then became a serial writer for Ruth Roland in 1920. Her first screenplay of many for Buck Jones was “The Throwback” in ‘35. 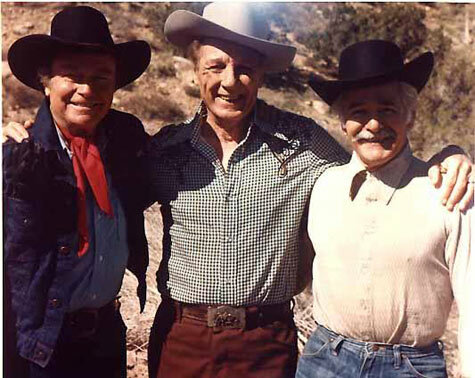 Guihan contributed scripts for Tim McCoy and Charles Starrett at Columbia. Her last was “Frontier Scout” for George Houston in ‘38. 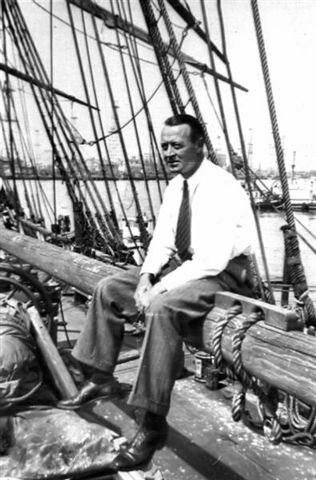 Not depending entirely on film writing for a living, Guihan owned a profitable anti-gray hair tonic company. She died December 21, 1951. B-western star Ken Maynard with his new wife Bertha Rowland Denham Maynard (10/28/40). They were married in Yuma, AZ. Bertha was a performer with Ken’s circus. 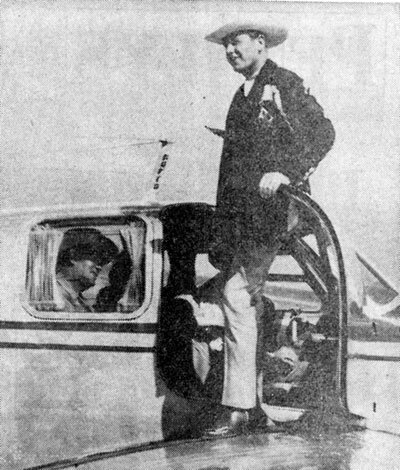 Rex Allen is greeted by Kansas Lt. Gov. Fred Hall at the airport. Partially obscured on the left is R. C. Hill, on the right is Herschel Holland, radio station KGNO program director who interviewed Rex. 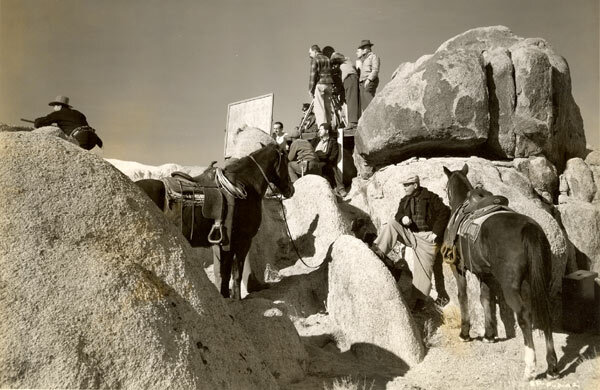 Amidst the Alabama Hills of Lone Pine, an RKO crew prepares to film a scene with badman Harry Woods atop the rocks on the left for James Warren's “Sunset Pass” (‘46). 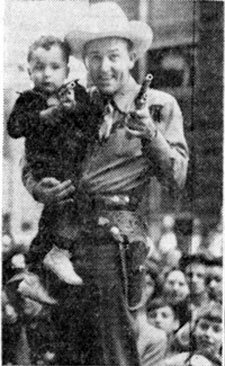 Monogram B-western star Jimmy Wakely shows 3-year-old Jerry Merlo of Calumet City, IL, how to be a cowboy during Jimmy’s personal appearance at Goldblatts’ department store in Hammond, IL, circa late ‘40s. 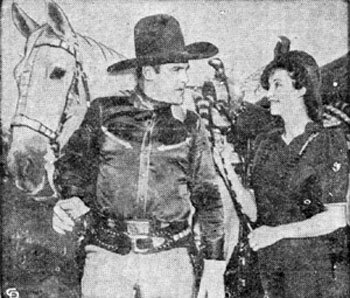 Jimmy and the Saddlepals were being featured at the time at the American Legion Rodeo at Soldier’s Field in Chicago. B-western and serial badman Terry Frost obviously picked up a little money posing for this May 1, 1944, LIFE magazine ad for Macmillian Motor Oil. 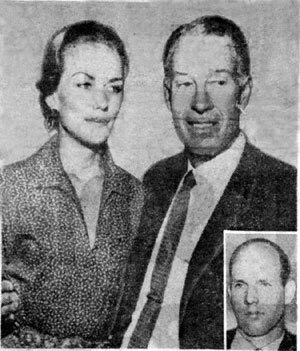 William (Bill) Elliott outside Los Angeles court (circa ‘59-‘60) with Mrs. Dolly Moore after she appeared at a custody hearing for her two children. A judge granted custody of the children to their father, William Moore (inset) of Evanston, after Moore testified he found his ex-wife and children living with the 55 year old Elliott on a ranch near Wells, NV. Elliott was still legally married to Mrs. Helen Elliott. 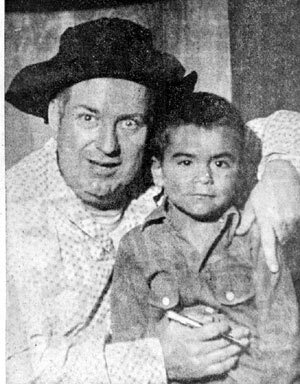 Smiley Burnette poses with a fan in Dodge City, Kansas, in October 1953. “You're gonna get a bang outta this!” Happy Fourth of July from B-western leading ladies Virginia Vale and Pamela Blake. 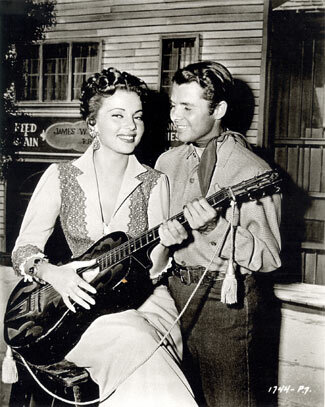 Band singer Abbe Lane and Audie Murphy between takes on “Ride Clear of Diablo” (‘53 Universal-International). 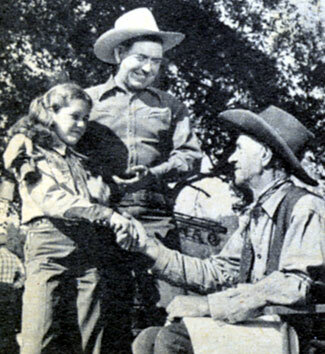 Johnny Mack Brown introduces his daughter, 12 year old Cynthia, to Milburn Morante, Johnny’s co-star in “Outlaw Gold” (‘50 Monogram). 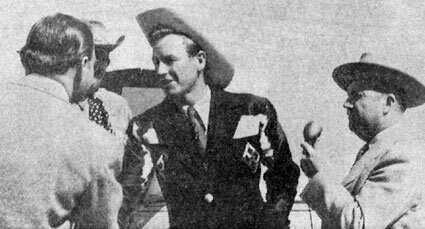 Roy Rogers, former Mascot Pictures head Nat Levine and Gene Autry who got his start at Mascot in “Phantom Empire”. 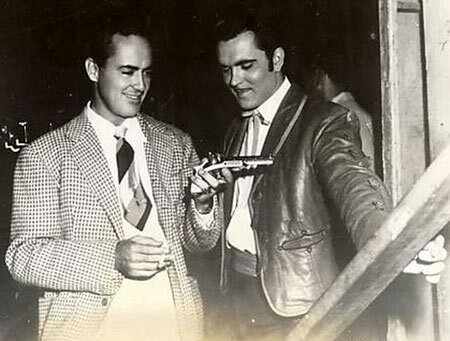 Former actor Buddy Rogers (left) turned producer for “The Adventures of Don Coyote” (1947) starring Richard Martin. This film was lensed in August ‘46, and a year later Martin, as Chito, joined Tim Holt, returning from WWII, in a post-war series of Holt westerns at RKO. 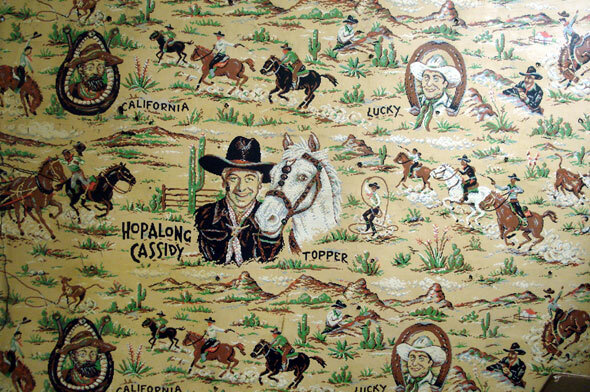 Their first together was “Thunder Mountain”, lensed in late ‘47. 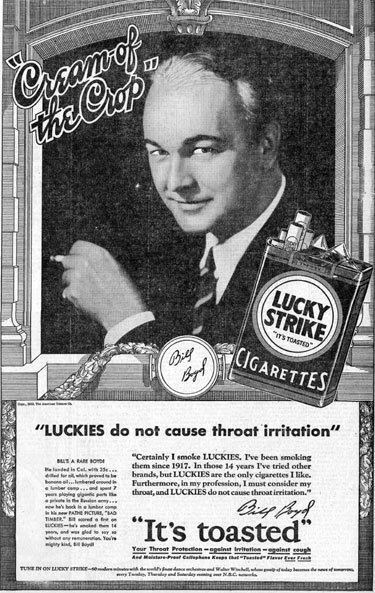 A pre-Hoppy Bill Boyd endorsing Lucky Strike on January 21, 1932. 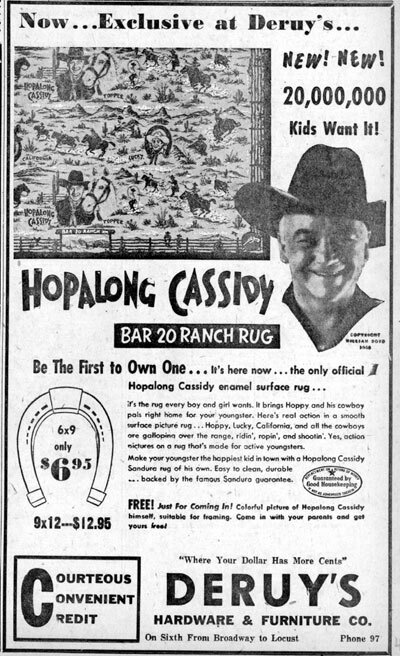 1950 ad for Hoppy Bar-20 “Ranch Rug” which in reality was nothing more than linoleum, which I can attest to as I have a large 7 ft. 5 in. by 6 ft. 10 in. 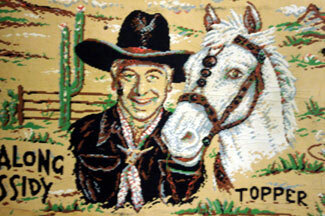 piece of Hoppy’s Ranch Rug (see below). According to Rebecca Hold, Deruy’s Hardware and Furniture was locatd in Pittsburg, KS. 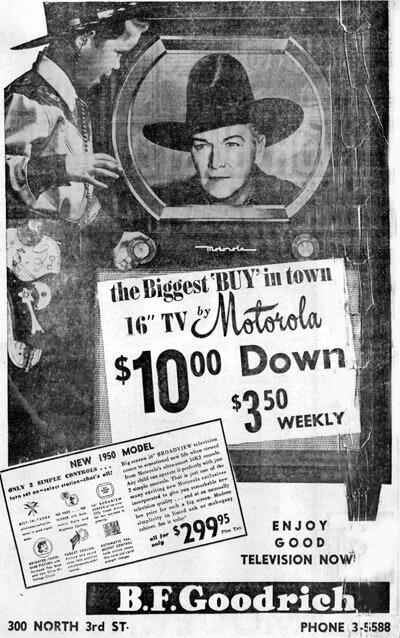 Motorola TV/B. F. Goodrich Store ad in Albuquerque, NM (5/8/50). 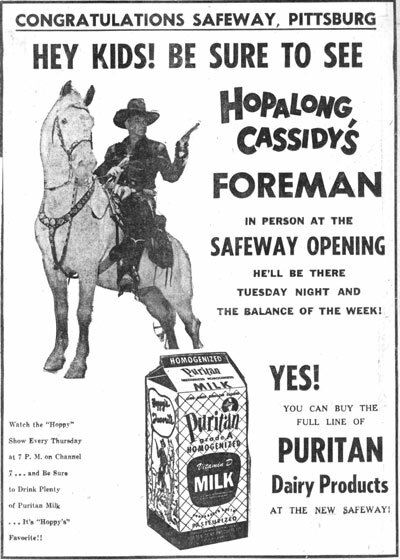 I assume “Hopalong Cassidy’s Foreman” was a local Hoppy TV host in Pittsburg, Kansas. Ad is dated June 1956.